The Classic Live-Action Feature Film! The imagination of a nine-year-old boy comes vividly to life in this fun-filled fantasy from Dr. Seuss. Young Bart Collins, lulled to sleep by the monotony of his piano lessons, dreams of a castle ruled by his piano teacher the eccentric Dr. Terwilliker. Dr. T is determined to prove that his Happy Fingers Method of teaching piano is the best method in the world. Having banished all other musical instruments to the dungeon, Dr. T lures 500 reluctant little boys to perform in a colossal concert on the grandest grand piano ever built. In his effort to escape, Bart comes in contact with some of the strangest characters imaginable. Siamese twins on roller skates, a human drum and the most memorable villain since the Grinch. Filled with surreal landscapes and tongue-twisting rhymes for which Dr. Seuss is famous, this is a movie children and their parents will love to watch again and again. 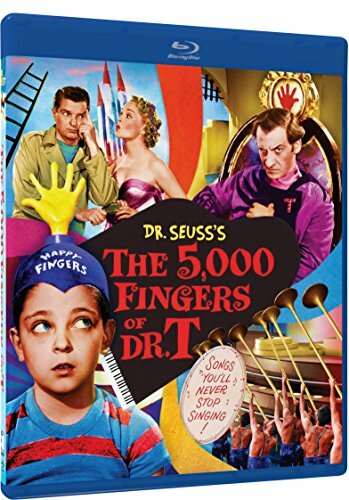 The 5,000 Fingers Of Dr. T is family entertainment at its best.